My go-to gift came through for me again, as I made a set of potholders for a house-warming gift over the weekend. I've even shared a similar set here before, but it's been a while, and the pattern is so darn good, it seemed worth sharing again. The tutorial is Caroline/SewCanShe's Log Cabin Hexi Potholders, and yes, partial seams are involved to get started, but it's all so doable, and a perfect scrap project. I used one layer of Insul-Bright with 1 layer of Warm & White batting, which is my standard potholder filling. So give them a try next time you need a little gift. And do tell. What's your go-to quick gift? 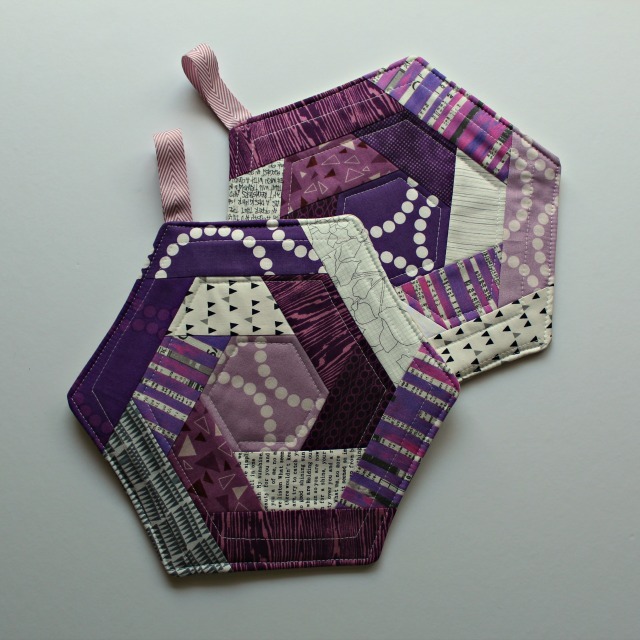 I like the 5 Minute Hexi Coasters (http://www.thistlethicketstudio.com/2015/11/5-minute-hexie-coasters-tutorial.html). I don't tend to have hexi's precut, so I even wrote a quick tutorial on how I cut fabric for them (http://quiltingjetgirl.com/2015/12/01/cutting-hexies-photo-tutorial/). Those are gorgeous! I may have to add that tutorial to my ever-growing to-make list! Love your potholders, thanks for the link. My current go to are the rope coasters. Previously I was into simple placemats or tablerunners. These are awesome - and I so love purple! My go-to gift are over mitts that aren't shaped like typical over mitts. The tutorial is from Esch House Quilts... I've used it numerous times! These are beyond great as a gift idea. I am drooling over the purple "scraps" that you used. We all need and have those go-to gifts! And if scraps can be used...all the better! Love these. I have to confess my go to gifts tend to be food. Homemade crackers and a bottle of wine. For a dinner party, I often take a tray or basket of breakfast pastries and a bag of coffee beans. Something the host can enjoy the next day after all the work that goes into have people over.